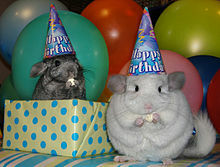 Two chinchillas come to attend an official party that was organized as part of my seneschal duties. Ottava Rima, also known as Ottava the Bound, Demon Prince of Albion. He is a scholar and researcher within the fields of Literature, Theology, Constitutional Theory, and 18th and 19th century Rhetoric and Language. He is the current Seneschal of Recent Changes, Grand Panetier of delicious muffins, and Lord Defender of the Lunar Sea. He also serves in the Luparii and is active in all things Tomfoolerish. This page was last edited on 26 December 2011, at 14:23.